It’s been a long, long time since we last got a new episode of BBC’s Sherlock. In the two years since series three has aired, I’ve graduated college, gotten at least three haircuts, and some guys named Benedict Cumberbatch and Martin Freeman have become huge stars. You probably haven’t heard of them. But trust me, they’re doing pretty well for themselves, which is probably one of the biggest reasons that it takes so long between each season of the show (seriously: series one aired in summer 2010, and series two and three were at the beginning of 2012 and 2014, respectively). But this year, we were given a late Christmas gift from the show’s creators Steven Moffat and Mark Gatiss: a full-length Christmas special, set in 1895 rather than modern day, to evoke the classic Sherlock Holmes stories. The episode begins with an image familiar to any Sherlock fan. We see John Watson in combat, just as we did way back in Sherlock’s series premiere — this time, he’s fighting in the Second Anglo-Afghan War, where he gets shot and ultimately returns to a miserable existence in London. A chance run-in with a former colleague leads to an introduction to Sherlock Holmes, who, like Watson, is looking for a flatmate. There were so many little references to their first meeting in “A Study in Pink” that, given how it started the episode, made me think the entire special would comprise reliving what we’ve seen so far of Sherlock and John’s story, just set in 1895 and making it fit the Doyle stories a little more rigidly. But that wasn’t the case. After Sherlock and John’s first meeting, it jumped ahead years later, where they’d clearly been colleagues and friends for a while. They’ve just returned from solving a case when Lestrade comes to visit and gives them their next one — a woman, Emelia Ricoletti, wearing a wedding dress on the day of her anniversary, opened fire on a street full of people before shooting herself in the head. Later that night, her husband is stopped by a mysterious figure in a wedding dress on his way to identify his wife’s body. The woman lifts her veil to reveal that she’s Emelia, despite the fact that she died hours before. She shoots her husband. Lestrade then takes Sherlock and John to the morgue, where we learn, to no one’s surprise, that Anderson is still inept in 1895. We also learn, once a disguised Molly Hooper arrives to take over from Anderson, that since her death and arrival in the morgue, Emelia somehow acquired blood on her finger and the message “you” has been written on the wall. Obviously, this is a perplexing case. And before you suggest that maybe Emelia had a twin pretending to be her, don’t bother; it’s never twins. There are lots of factors to consider here, but Sherlock just can’t move past the fact that it’s impossible to survive blowing your brains out. There’s just no way. Of course, he’s not talking about Emelia here — it’s made pretty apparent that his real fixation is Moriarty. And this implies that this episode takes place exactly where we left off in series three (though, presumably, with prior events being adapted to work in 1895), with the (apparent) reveal that Moriarty is back after killing himself in the series two finale. With no real evidence to go on, and the fact that Sherlock is stumped (not that he’ll ever admit it), the case grows cold and unsolved for a few months. There are some subsequent murders, where someone dressed as the bride appears and murders a man, then writes “you” on the wall, but Sherlock quickly dismisses these as copycats, made possible by the heightened media attention since the original case. He also realizes, after Lestrade points it out, that John and Mary have moved out of 221B, though it seems like they’ve lost some of their domestic bliss. Mary’s been part of a campaign for women’s right to vote, and it seems that or whatever other causes she’s taken up demand a lot of her time. John prepares to eat a lonely breakfast by himself (not really, he’s got a maid to yell at, he’s fine) before receiving a telegram from Sherlock, requesting his help. They’re needed at the Diogenes Club, where an incredibly overweight Mycroft (in a nod to the original Holmes stories) alerts them of an upcoming case. He’s cryptic as always, in true Holmes fashion, but says that someone will be coming to see them to investigate a crime that relates to a certain political agenda. The case? A woman named Lady Carmichael is worried about her husband. He received an envelope containing only five orange pips (a wonderful nod to a Holmes story, which was in turn referenced in “The Great Game”), which seemed to terrify him. Two nights later, he woke up in the middle of the night and stared out a window, claiming to see the bride, but she quickly disappeared. Then, the morning of Lady Carmichael’s visit, she found her husband in the garden with the bride, who announced that Sir Eustace would die that night. Sherlock quickly comes up with a plan to save Sir Eustace and catch the so-called ghost, but things don’t exactly work out as planned, and Sir Eustace is stabbed. More to Sherlock’s concern? A small tag has been left with the dagger, with the words “Miss me?” written on it. Watching Sherlock has always seemed like putting together a puzzle. But the kind of puzzle that you’re putting together with small children, so sometimes they throw pieces at each other or hide them while your back is turned. And then it turns out that actually another puzzle got mixed in with yours, so you’ve been working with the wrong pieces half the time. There’s just no way the viewer can ever be ahead of Sherlock in his deductions. “The Abominable Bride” is the first time the format of an episode has been just as confusing as one of Sherlock’s cases: it’s set in Victorian England because that’s when the original Sherlock Holmes stories were set, but so what? The creators made the decision to make this a modern adaptation, and given how they’ve used technology and other advancements to work in their favor in unfolding the mysteries, it’s not exactly like the show is missing anything by being removed from its Victorian background. It provides sentiment, and a little bit of a joke, but it’s not exactly purposeful to make the tenth episode of a show so dramatically different just for the sake of a joke. But seeing “miss me?” and Sherlock’s reaction to those words provided a piece of the puzzle we didn’t even know we were missing. It hasn’t all clicked yet, but seeing that reference to Moriarty, an image that closed out series three, makes it clear that something larger is going on. There is a reason for the time shift, even if it’s not totally apparent yet. This all comes to a head when Sherlock prepares himself for a visit from Moriarty, who he now knows is alive, despite the fact that he shot himself in the head. Part of that preparation includes injecting himself with his seven percent cocaine solution, so he’s a little swimmy when Moriarty shows up. And that’s finally when all the pieces click — Moriarty taunts Sherlock with the knowledge that all of this has happened before, and in fact, it has. Everything we’ve seen in the episode has taken place in Sherlock’s mind palace just after the events shown in the series three finale. In the five or so minutes between finding out Moriarty is supposedly back and his plane landing, Sherlock imagined everything to try and solve a hundred-year-old case: that of Emelia Ricoletti, the bride who rose from the dead. In turn, it’s really just a way for him to process what’s happening with Moriarty. When Mycroft, John, and Mary board the plane, they discover that Sherlock was reading one of John’s old blogs, the one that accounted the first time they met, explaining why that was depicted in Sherlock’s mind palace. But the worst discovery, something Mycroft knows immediately, is that Sherlock is high. At his brother’s insistence, Sherlock hands over a list of everything he’s taken, something that’s apparently become a tradition between the two whenever Sherlock starts using. The questions surrounding Sherlock’s drug use have come up here and there throughout the show, but we’ve never really seen it outside of Sherlock’s perspective, let alone from Mycroft’s. It was a really nice touch to see how concerned Mycroft was for his little brother, and the perspective he has on the situation that Sherlock refuses to acknowledge. Another really lovely human moment (as much as Sherlock despises that sort of thing) came when John tried his hardest to bond with Sherlock while staking out the Carmichael estate. Some of the series’ best scenes have come from Sherlock’s objectivity and lack of emotion being called into question. And with everything these characters have been through, it felt like it’d been a while since we’ve seen John and Sherlock slow down and touch base with each other. With John getting married and moving out of 221B just as Sherlock was beginning to be able to articulate what their friendship meant, there’s a lot between the two that’s gone unsaid for a while. This scene becomes even more poignant with the realization that it’s all happening inside Sherlock’s head; this is what he wants to hear John say — that Sherlock’s not just a machine, that he has a heart. For as surprised as Sherlock has been in the past whenever John’s given him a genuine compliment, and for as much as he still doesn’t want to hear anything affectionate, it’s finally made clear that Sherlock understands his friendship with John, and perhaps more importantly, that he has something to offer another person. Once Sherlock becomes aware that the whole conceit of the Ricoletti and Carmichael cases was just made up in his head, the details get a little fuzzier. Instead of seeing every step, things become a little more convenient; Mary, who’s been working on Mycroft to keep an eye on Sherlock, leads her boys to an abandoned church that she claims holds the heart of the conspiracy. And in fact, it does: they interrupt an in-progress meeting of a women’s group, where the final pieces of the case are laid out. Emelia Ricoletti was a member of the group, and to help their agenda gain traction within the public (and considering Emelia was already dying from consumption), she arranged a very public suicide — or at least, pretended to commit suicide. A fake body was laid out (much like it was when Sherlock faked his death in series two) and the real Emelia Ricoletti, still alive, later killed her husband, then killed herself and had another member of the group switch her body out with the fake in the morgue. The reason for all of this? To gain more support for women’s rights, and the women within the group who are tired of being sidelined and pushed around by men. Members of the group include Emelia, Lady Carmichael, John’s housemaid, and our favorite pathologist Molly Hooper, who disguises herself as a man so that she’s able to work in the morgue. I’ll admit, for as much as I’m all about female empowerment, this scene came off a little heavy-handed. Sherlock has gotten criticism for how it treats female characters, and while I don’t totally agree with those claims, having one episode build to a scene that expounds on the value and necessity of women doesn’t exactly solve anything. Maybe it was intended to offer more of a gentle correction than directly refute the claims entirely; more along the lines of “this is what we meant” rather than going overboard to prove dissenters wrong. It’s maybe not the most fulfilling solution to a mystery, but the nature of the episode allows for that. It’s even remarked upon in the episode — not everything has to make sense, because this is all just in Sherlock’s head. Also happening in Sherlock’s head? A redo of the Reichenbach Fall, this time on an actual waterfall. Thankfully, there’s no need to fake his death this time, because John appears and, while holding a gun on Moriarty, manages to bring everything under control. It’s idealistically simple, of course, but maybe there’s some commentary there about how Sherlock isn’t worried about bringing down Moriarty again, if that’s what’s necessary — as long as John is by his side. I don’t know, guys, I don’t think I’m totally over Johnlock. Of course, along with all that, Sherlock keeps popping in and out of consciousness. He’s casually overdosing on the plane, but instead of listening to everyone’s concern, he jumps up and demands to see Emelia Ricoletti’s grave to prove that a fake body was used and buried along with the real Emelia. He forces Lestrade (it’s always Lestrade) to help him dig up the grave, but only finds one skeleton — which suddenly comes to life and attacks him, revealing that what we thought was reality isn’t actually so real after all. Back on the Reichenbach Falls, Sherlock decides to jump off, figuring that’ll snap him out of this dream once and for all. It does, and he wakes up on the plane, this time for real. But there’s still no time to dawdle on the fact that he overdosed — he’s got to get out there and figure out why someone is pretending Moriarty is alive. After the series three finale aired, I was a little nervous about the future of Sherlock. Logically, I knew there was no way Moriarty was alive, but that was just it. I didn’t want the writers to abandon logic and bring him back just for the sake of bringing him back. This Christmas special seemed to answer all my concerns directly. It was a response to “His Last Vow,” starting right where it ended and handling the fallback of that huge revelation. And that right there is what makes Sherlock so special and so unlike anything else on TV. Most shows will, here or there, throw in a fun episode — a musical, or something rife with callbacks, something purely intended to entertain the audience. 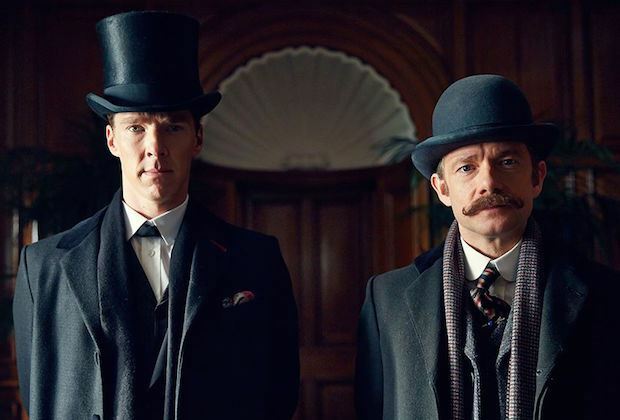 And “The Abominable Bride” certainly did that; as a Sherlock fan, it was so special and interesting to see the characters we’ve come to love transported back to their original setting, and see how they still manage to seem like themselves, not Doyle’s versions. But this wasn’t just about delivering a fan service-y Christmas special; with three episodes in each series, Sherlock doesn’t exactly have the ability to waste time like that. The point of the episode was purposeful, and it managed to further the plot and overall arc of the show while still entertaining its passionate fanbase. What did you all think of “The Abominable Bride”? Is anyone still thinking that Moriarty is actually alive? Let me know your thoughts, and hopefully this episode was enough to tide everyone over until series four, tentatively scheduled for early 2017. For now. Maybe. Please, Mark and Steven, I can’t wait longer than that.